Thank you for your interest in Denver! The Public Relations and Communications Team at VISIT DENVER serves as a resource for journalists requesting press materials, research, access to tourism activities and attractions, coordination of media rates, and general information on Denver as a tourism and convention/meeting destination. If you are planning a visit to Denver and wish to explore our city on your own, we also have a number of free resources to assist visiting journalists including: press kits, photos, HD b-roll, itinerary suggestions, local tourism contacts and the Denver Passport, which provides free admission to dozens of major attractions. 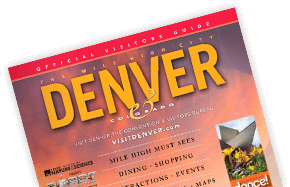 *Note: When publishing or presenting information from this website, please attribute to "VISIT DENVER, the Convention and Visitors Bureau" unless otherwise specified.